The Samsung Galaxy J7 Prime is among the Korean company's mid-rangers, but it comes with plenty of bang for its buck. Metal body, fingerprint scanner, 2.5D glass, and other features of the kind are all present on this $300 handset. What it lacks is Android 7 Nougat. The phone launched with Android 6.0 Marshmallow last year, and it's been sitting on the same OS version since. 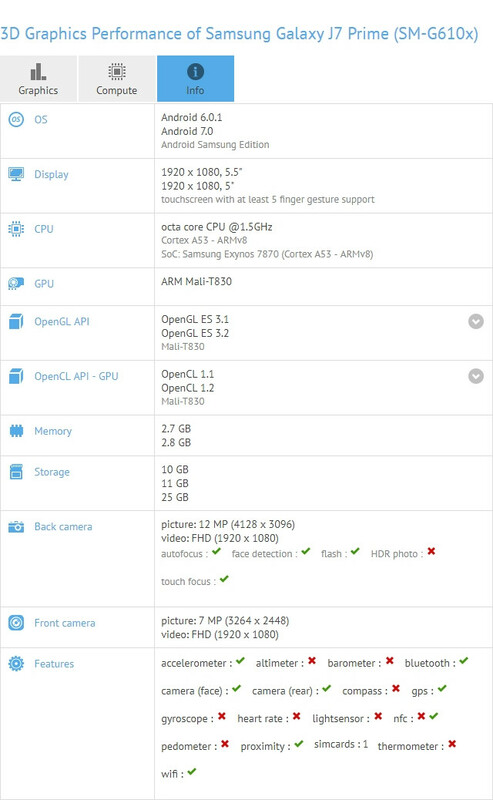 However, SamMobile unearthed an entry at the popular benchmarking databse, GFXBench, that reveals a Galaxy J7 Prime running Android 7.0 Nougat. This could mean that Samsung is currently testing a software update to said version for the mid-ranger. Whether this means that the phone will receive the new Samsung Experience UI is still unknown, but we believe it's highly likely. That being said, until we know more, we can't really say for certain if the Galaxy J7 Prime will move away from TouchWiz or not.